Discover our all-new Australia and New Zealand cruises to experience what the rest of the world only imagines. These exceptional voyages travel to destinations both familiar and far-flung — the Great Barrier Reef, Tasmania, New Zealand, Bali, Singapore and more. From sophisticated Sydney to primitive Komodo, we encounter the legendary Tasmanian Devil and fearsome Komodo dragon, plus sharks, crocs and other toothy types. Visit lavender fields, sheep farms and a remote island full of pearls. Sip the nectar of coastal vineyards. Meet Aboriginal artists and uncover seal colonies rarely seen by humans. 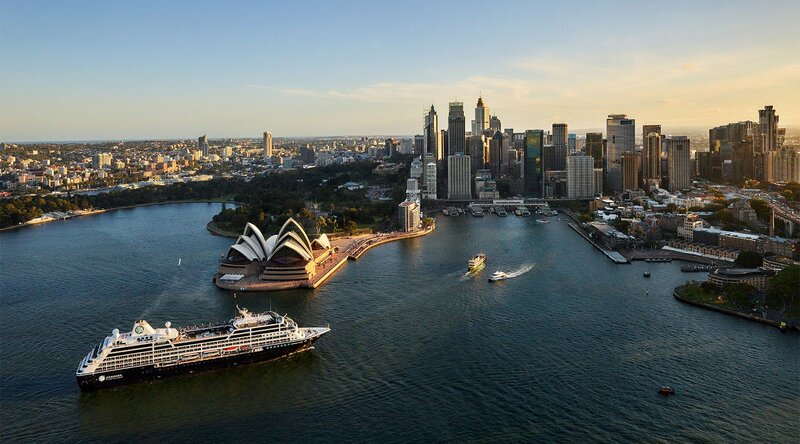 Travel the diverse expanses of Australia and New Zealand with Azamara’s destination experts. It’s more than just a far-ranging journey — it’s beyond all you imagined. In Australia, specialty tours are operated by Abercrombie & Kent with singular service and amenities. These premiere tours are an all-new way to experience A&K’s superlative heritage of luxury travel while sailing with Azamara Club Cruises®. Explore the hidden corners of Australia, New Zealand and beyond with Azamara Shore Excursions. Over 75 unique tours reveal the cultures of Oceania, connected by the great blue waters and a love of nature and new friends. Delve into the heroic and horrific whaling days of Albany at the only museum in the world set within an original whaling station. Savor the superb vintages of Brancott Estate, the premier winery in Marlborough, during a private tasting followed by a scrumptious three-course lunch.